High Availability and Advanced Online Backup Services. Restoration time after a loss of information is a key concern for large and small businesses alike. 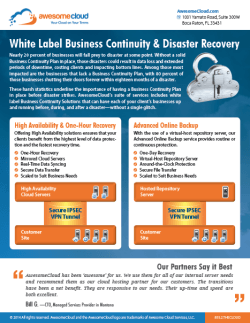 When a client requires 24/7/365 access to their data and applications, you can offer High Availability Online Backup and One Hour Recovery (OHR) as a white label service to secure their trust and build your status as their trusted advisor. Powered by Double-Take Availability®, AwesomeCloud’s High Availability Backup service offers one hour recovery by operating a mirrored replica of a client’s on-premise server using our secure cloud-based infrastructure hosted at Verizon Terremark’s NAP of the Americas. In the event of a emergency, you will be able to quickly access and restore a client’s critical data if, for any reason, their on-premise system fails in a hot-standby environment. When a client leverages our High Availability Backup service, their data is always accessible within minutes. You have the flexibility to direct your mirrored cloud servers to take over in the event of an on-premise system failure or outage. Your clients’ data is stored in our secure cloud infrastructure and available for retrieval in just minutes. This offers the highest level of security, scalability, and accessibility. Your clients’ file and data changes are automatically updated to ensure restoration in case of an on-premise data. Your clients’ data is securely encrypted, enabling you to provide the highest level of security and peace of mind. When you utilize our High Availability Backup service, your clients have the option of a full restoration or single-file. Partner with AwesomeCloud and offer High Availability Backup services to grow your Managed Services business. Contact us by phone at 855.2.THECLOUD, by email at sales@awesomecloud.com, or by filling out a quick contact form.